Earn $3.51 in VIP credit (351 points)What's This? The Shimano Dura-Ace FC-R9100 11-Speed Chainrings are precision crafted to work perfectly together with the rest of the Dura-Ace R9100 groupset. Featuring Hollowglide construction technology and a universal BCD for all chainrings in the R9100 line, the Dura-Ace chainrings are stronger, stiffer, lighter, and easier than ever to install. 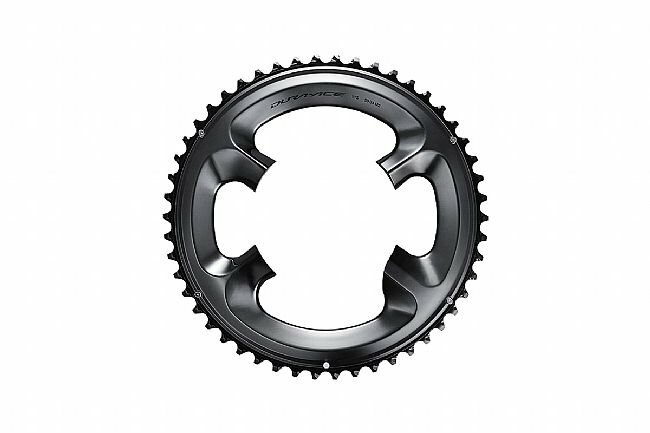 The Shimano Dura-Ace FC-R9100 11-Speed Chainrings is available in a variety of sizes for inner and outer ring applications. I just replaced all the components on my 15 year old Seven Axiom frame. Since my frame has S & S couplers, I wanted wireless electronic shifting so I went with SRAM e-tap wireless shifters and derailleurs. All the other components are Shimano Dura Ace 11 speed including the crankset which came with 53/39 chainrings. The lower gearing was a little too high for my liking so I changed out the 39 tooth chainring for the 36 tooth chaniring I ordered from Bike Tires Direct. The change out was very simple and took no more than five minutes. Now my lower gearing is perfect!